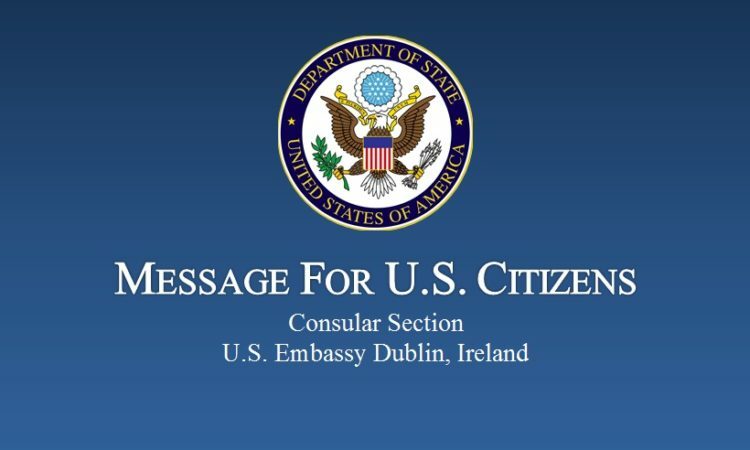 The U.S. Embassy in Dublin advises qualified students who are interested in applying for the J-1 Summer Work Travel (SWT) or Camp Counselor program in 2018 to be proactive and begin the application process as soon as possible. J-1 Photo and Video Contest 2017! J-1 Photo Contest – send your entry now! Ambassador O’Malley and his wife Dena paid a visit to the townland of Carna, Co. Galway on Sunday, 26 April 2015 where they met with the Emigrants Commemorative Centre committee and Carna Nursing Home Some eminent politicians past and present in the United States are descendants of the Carna area. U.S. Ambassador to Ireland Kevin O’Malley welcomes an audience from across Irish society to the Embassy’s annual economic conference, held this year at his residence, Deerfield in Dublin’s Phoenix Park. The U.S. Embassy & Foreign Commercial Service Office supported a USA Pavilion at the Holiday World Show in Dublin on January 23-25 and welcomed more than twenty exhibitors for destinations, attractions, airlines, hotels from the United States. U.S. Ambassador Kevin O’Malley performed the official opening of the USA Pavilion and toured the booths along with Senior Commercial Specialist, Finola Cunningham. Ambassador Kevin O’Malley held his inaugural forum with the U.S. Embassy’s Youth Council on Saturday, January 18th. The Youth Council was launched by former Secretary of State Hilary Clinton in December 2012 and consists of over 70 members, aged 18 – 25, from all over Ireland. Ambassador O’Malley attended the first day of the Dublin Web Summit and helped ring the NASDAQ bell with Taoiseach Enda Kenny. He also got around to meeting social entrepreneurs, CoderDojo, Eva Longoria and many more people throughout the day. On Thursday November 13 2014 Ambassador Kevin O’Malley visited the University of Limerick. While there he stopped by the World Irish Music Academy and heard some traditional Irish music. On October 28, 2014 Ambassador O’Malley joined George Hook for his drivetime show on Newstalk to talk about St Louis, being U.S. Ambassador to Ireland, Northern Ireland, Irish ancestry and many other topics. Follow the link and the interview begins at 05:50. Ambassador O’Malley and his wife Dena invited a gathering of people from across the worlds of politics, business, music, literature, the arts, charity and academia to their residence in the Phoenix Park for a welcome reception on October 14th. Ambassador O’Malley presented his credentials to Irish President Michael D. Higgins on October 8, 2014. Ambassador O’Malley spoke of his immense pride in his Irish roots and his honour in being appointed by President Barack Obama to the post. On Sunday, October 11, 2014 Ambassador O’Malley joined Marian Finucane in studio on RTE Radio 1. The Marian Finucane Show is Ireland’s most popular weekend radio programme. Ambassador Kevin O’Malley’s first few days in Ireland involved presenting his credentials to Irish President Michael D. Higgins at Áras an Uachtaráin and then later in the week meeting Taoiseach Enda Kenny at his offices. Say hello to new U.S. Ambassador to Ireland Kevin O’Malley from St. Louis, Missouri. Where should he visit in Ireland? Tweet @usembassydublin with your suggestions!